MELVILLE, N.Y., September 17, 2015 – Although Canon EXPO 2015 New York may be over, Canon U.S.A., Inc., a leader in digital imaging solutions, today announced that it will extend the excitement to those unable to attend, via the first-ever virtual tour on the Canon EXPO Website. This site will provide rich online content that recaps being at the company’s five years in the making EXPO, recently held September 10-11 at the Jacob K. Javits Convention Center in New York City. Revealing Canon’s vision into the future of imaging technology, Canon EXPO 2015 New York featured more than 100,000 square feet of exhibition space, showcasing a combination of current and future Canon products and highlighted how powerful and innovative imaging technologies enhance homes, universities, businesses, hospitals, stadiums, movie sets and more. The Stadium Zone, an impressive recreation of Yankee Stadium, where visitors can find information on the cameras and lenses professionals choose to capture the action and bring memorable events to life. 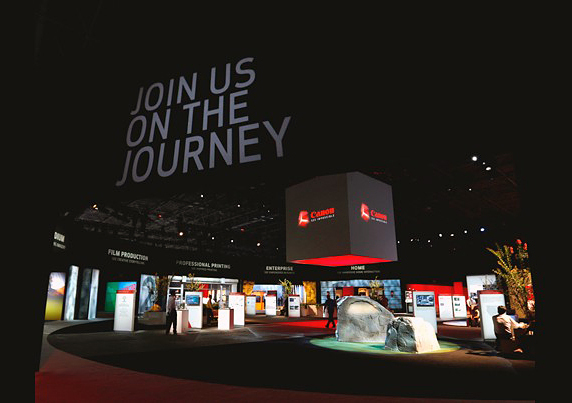 The Imaging Journey Zone highlights the evolution of imaging including a 4K projector capable of 8K projection, under development, as well as museum quality printing technology. The Professional Printing Zone provides visitors with information on a range of large format printers including the Oc‚ Arizona Series flatbed printers, the Oc‚ varioPRINT i300, and the award-winning Canon imagePRESS C10000VP Digital Press, which sets a new quality benchmark in its class by delivering robust productivity of up-to-100 images per minute. The Home Zone allows visitors to experience modern home imaging solutions for the always-connected generation. The Enterprise Zone shows how Canon supports businesses worldwide and spotlights Canon’s new Rich Collaboration System, an innovative communication platform under development, allowing businesses to connect virtually to enhance communication. The Film Production Zone highlights new ways to help professional storytellers bring their visions to life. Cinematographers, videographers, photographers, production companies, broadcasters and networks can benefit from Canon innovations designed to achieve greater levels of depth, detail and dimension. The Customer Experience Zone provides access to information on Canon’s Live Learning programs, professional imaging services as well as its commitment to top-notch customer service. The University Zone demonstrates ultra-high zooming capabilities when utilizing a 250 megapixel CMOS sensor as well as optical technology behind the Subaru Telescope. The Advanced Industry Solutions Zone features a glimpse into Canon’s MREAL Solution demonstrations. Canon EXPO will visit Paris and Tokyo later in 2015 and Shanghai in 2016. You can read an interview with Mr. Masaya Maeda, Canon’s Senior Managing Director and Chief Executive of Canon Inc’s Image Communication Products Operations, conducted during the Expo. Canon Powershot G17 Coming In October? Canon Planning To Add WiFi To Pro DSLR Bodies?